The story of Wren Kitchens is nothing short of a phenomenon. Although Wren’s founders had kitchens in their DNA – the same team ran Hygena QA back in the 1970s – at its launch in 2009 Wren was a late entrant into a competitive fitted kitchen market dominated by giants B&Q, Magnet and Wickes. Wren had to be different – and it was. It had invested in state-of-the-art manufacturing plants, amazing designs and an ambitious expansion plan. Its founding principle was to make fabulous quality, British manufactured, fitted kitchens affordable for everyone. In 2013, we began to work with Wren to tell its story. Our strategy was to demonstrate in all marketing materials that Wren offers customers more – more value, more service, more choice, more quality. 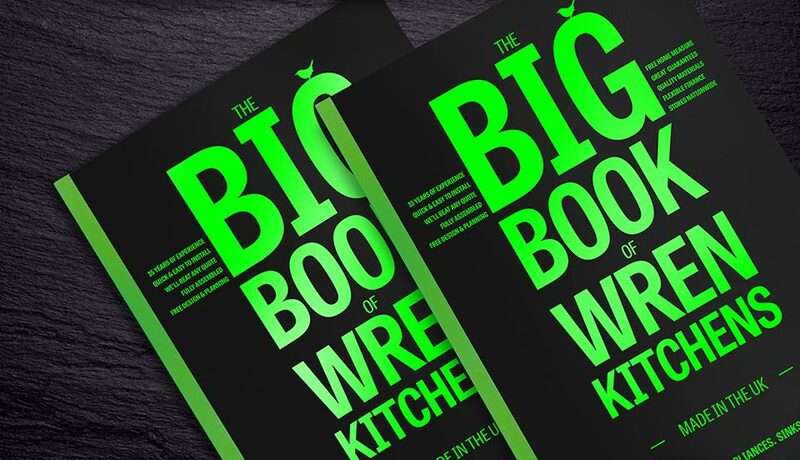 In The Big Book of Wren Kitchens – a 212-page manual that helps customers buy the kitchen of their dreams – we combined an editorial approach with a catalogue. This positioned Wren as a kitchen expert, understanding what the customer wants and being on their side in the complex and costly decision-making process of buying a kitchen. As well as beautifully showcasing the range and all key messages, The Big Book gelled with customers nationwide and created a real point of difference for Wren. It is regarded as a game-changer in the industry and was reprinted three times. Since then we have worked with Wren’s marketing, training, senior management and recruitment teams – developing and telling its story externally to customers and potential customers and internally to employees to introduce new ranges and processes, manage change and increase productivity. We also helped Wren develop and launch its exclusive Linda Barker brand with a glamorous logo, brochure and colour card. Understanding Wren’s ambition and executing this across multiple channels – from ads and advertorials to showroom point of sale and posters, training manuals and customer service emails – has made this a successful and exciting partnership. In 2016, this partnership took a step further when Wren raised the bar in the fitted kitchen market and launched the Infinity Collection. Infinity is the largest and most diverse range of kitchens in the UK with thousands of styles, unit sizes and special feature units that means a customer can have a kitchen that’s virtually bespoke at a fraction of the cost – a dream come true for many homeowners. With £50 million of investment and manufacturing expanded to three sites covering a total of 1.5 million square feet, Infinity was a massive step for Wren – and the industry. The fabl was involved in the development of the Infinity brand from the beginning with our ‘Dream, Explore, Discover’ strategy. We created the brand logo – an elegant yet approachable ID that incorporates the Wren icon in an organic way – and the campaign line ‘Every Kitchen You’ve Ever Dreamed Of’ to reflect that Infinity gave customers the biggest possible choice yet remained affordable. Selling that choice was a challenge for staff so part of the pre-launch strategy was an internal brochure to gel with Wren’s showroom sales teams. ‘Every Kitchen You’ve Ever Dreamed Of’ provided the perfect springboard to showcase the fabulous kitchens and was used in the launch ad campaign and advertorial series. Along with ’Dream, Explore, Discover’, it was also used in showrooms nationwide. A stunning launch brochure took the brand a step upmarket with beautifully textured matt stock and fabulous renders enhancing the customer experience. The navigation, content and copy was as warm and approachable as ever to appeal to Wren’s core demographic. The combination of internal and customer facing communications with clear messaging boosted Wren’s sales teams’ selling confidence. If they believed in the product, so would the customer. 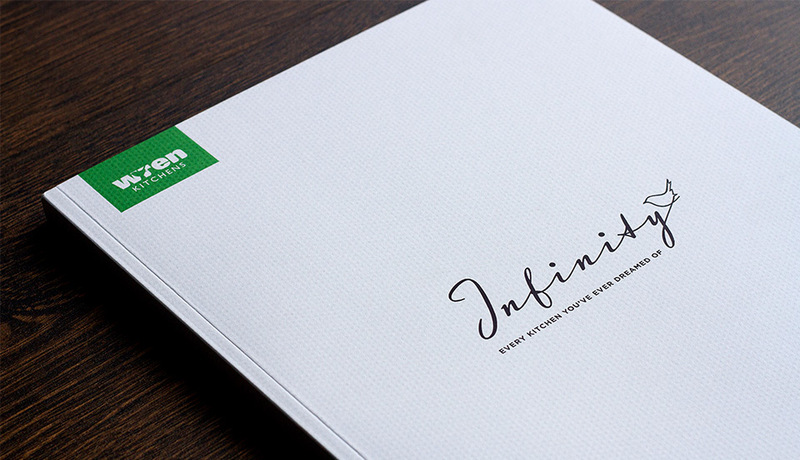 With a print run of 250,000, followed by another six months later, the Infinity brochure has been an outstanding success for Wren, as has the entire launch. A perfect example of finding another story for Wren and making it stick. Wren is now the UK’s number 1 kitchen retail specialist and we are immensely proud of this achievement and the part we’ve played in it. Since becoming its marketing partner, Wren’s network of showrooms has grown from 17 to 61 showrooms and counting. Along the way, we have told Wren’s story consistently and creatively to internal and external audiences in brochures, point of sale, ads, brand logos, training manuals, annual reports, customer service communications, advertorials and promotions. For both us and Wren, it is an ongoing, phenomenal story.